Summary: It should be easier to film your talks when practicing at home. Not everyone can make it to a conference or meeting where you present, but it's really easy to share a video of your talk with the entire world on Vimeo or YouTube. Sal Khan has shown how one guy can change the world with some screencasts, and I'd like to see the power of that fall into the hands of anyone with a Mac. I wish Keynote made it easier, and hopefully the next version does. – get two macs running ichat that can talk to each other (one computer was using my AIM screenname, the other my .Mac screenname). Disable all audio in/out on the second computer you don't present on. 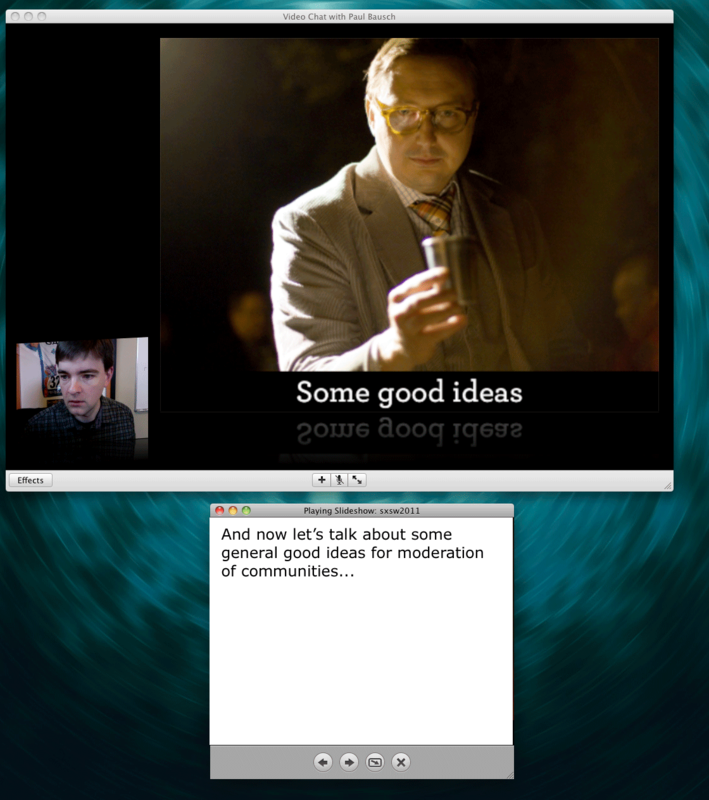 – Start a video chat between the computers, then drag your keynote file into the lower half of the video chat window to start "iChat Theater" on the computer you will present from. – Resize the video chat window to something around 1024×768 in size, then start screencasting software (I use ScreenFlow) to record the entire desktop and make sure to capture the computer's audio. – Walk back to your presenting computer, give your talk. – Walk over to your screencasting computer, hit stop. Edit out the beginning and end of walking between computers, zoom the video so only your presentation shows in the viewport, then save. – Export video out (I used the 960×540 AppleTV size, and it took about an hour to render) then upload to Vimeo. You can currently rehearse your talks in Keynote, but it creates a slides-only video with your recorded audio. Most macs all have iSight cameras in them, so I'd really like to see a single mac option to record a video exactly like the screenshot above, without the need for a second mac or complicated screencasting software. Overall, I think this would make a killer addition to the next version of Keynote, and let people share their knowledge much easier and to wider audiences. ScreenFlow lets you record video from the iSight in addition to the desktop, and merge them together with the picture-in-picture display like you had. Only one mac needed. Still, I agree it’d be great to do this from within Keynote itself. If Lion includes Mac OS Server, I am hoping that means Podcast Producer will be included too. This might solve some of the problems you raise. So, I was intrigued enough about recording my own presentations that I went home tonight and played with ScreenFlow and think I found the ideal setup. I’m using a MacBook Pro, but this would work on any modern Mac with an iSight camera. First I set up a custom view in KeyNote’s “Practice Presentation” display. I turned on the current slide, the next slide, the timers, and the presenter’s notes. 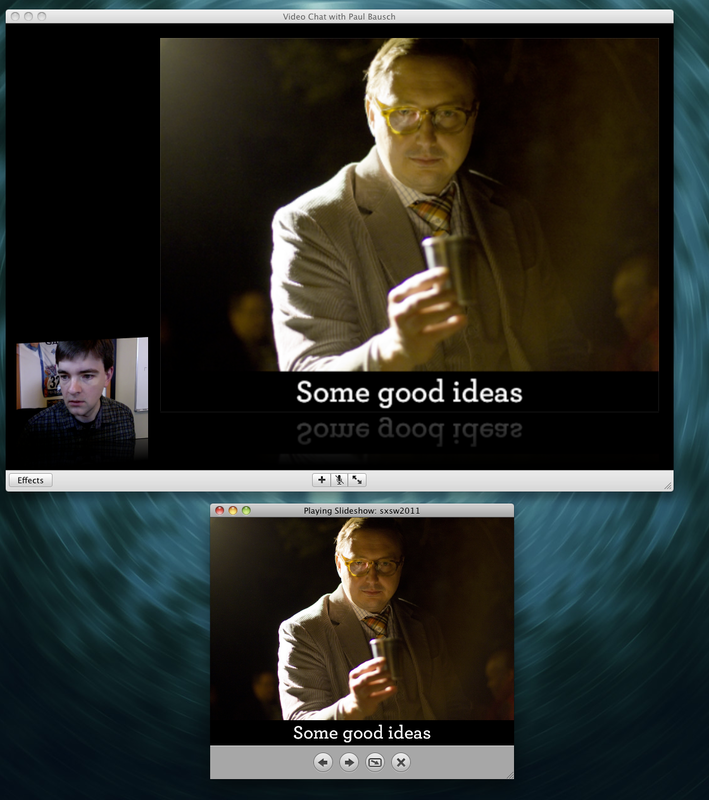 Then, in ScreenFlow, I started a new recording that captured the Display, the iSight, the system sound, and my mic’s sound. I pressed record and flipped over to Keynote and gave my presentation in practice mode. When done, I stopped the recording in ScreenFlow. I enlarged the screen recording to 180%, so that the “Current slide” was the only thing showing. I positioned it to the upper right of the recording view, and that gave enough margin to the right that I could put the iSight’s recording, shrunk down to 66%, over to the right. I turned the y-axis rotation knob just a bit to give it the fancy angle view like you had. And that was that. It put out a fantastic recording, containing the slide and me talking, and I had access to the next slide and presenter’s notes while doing it. I think I’ll be doing this for every talk I give from now on — I had been taking FlipCam videos of them and editing that in with the slides, and that was hit & miss, and a lot of work besides. Your way, via ScreenFlow, is easy as can be, and the result’s a lot better. Thanks for the tutorial! I tried doing it your way, but unfortunately the bandwidth in my house meant that the ‘receiving’ computer was getting pretty jerky video. 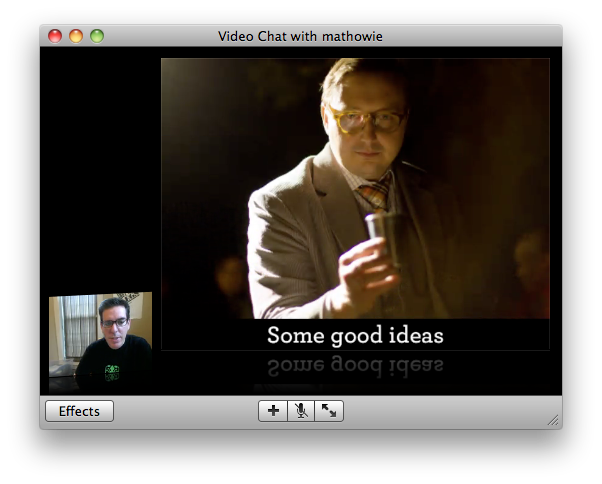 I came up with a solution though – use Screenflow on the ‘presentation’ computer, enable the ‘Show Local Video’ option in iChat, and put a sock over the ‘receiving’ computer’s camera. Basically, it looks the same as yours, but my picture is on the centre-left instead of bottom-left. It also has the advantage of being rather smoother all round, since you’re recording local input.